In the academic year 2017/2018, there were 153,300 students acquiring general education, 24,100 vocational education and approximately 46,200 higher education in Estonia. 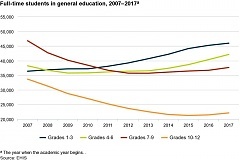 Compared to the previous academic year, the number of students in general education increased by 4,100; in vocational education it decreased by 900 and in higher education by 1600. According to members of the Estonian government, the national designated spatial plan for a pulp mill in South Estonia failed as there was not enough cooperation with the local government and community when initiating the plan, informs LETA/BNS. Data of the Central Statistical Bureau (CSB) show that, compared to April, in May 2018 level of producer prices in the Latvian industry rose by 0.1%. Prices of products sold on the domestic market reduced by 0.2%, but prices of exported products went up by 0.5%. Prices of products exported to euro area countries increased by 0.2% and prices of products exported to non-euro area countries – by 0.7%. The Lithuanian seaport of Klaipeda handled 18.223 million tons of cargo during the first five months of 2018, up 5.8% from 17.232 million tons a year ago, the port's authority told BNS/LETA. Lithuania's Butinge crude terminal, which is owned by Orlen Lietuva, the Lithuanian unit of Poland's PKN Orlen, handled 3.616 million tons of crude in January through May, up 1.1% from 3.577 million tons a year ago, the Klaipeda port authority told BNS/LETA. The European Bank for Reconstruction and Development (EBRD) is lending 30 million euros to Scandagra Group, a leading fertilizer and grain trade group in the Baltics, with the money to be invested in organic farming in Lithuania, Latvia and Estonia., reports LETA/BNS. Latvia will continue supporting Ukraine's aspirations to build closer relations with the EU, Latvian Foreign Minister Edgars Rinkevics (Unity) said during the meeting with Ukrainian Foreign Minister Pavlo Klimkin in Kyiv on June 20, informs LETA.